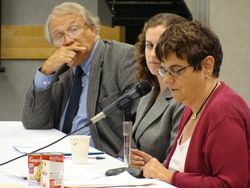 Susan Linn, from the Campaign for a Commercial-free Childhood, testifies in support of an expansion of Maine’s BPA ban. Who can argue that moms and kids should have to worry about exposure to BPA just by buying a can of food off the shelf at the grocery store? Almost no one, apparently. At a hearing on a proposed rule in Augusta last week, not one mother, father, doctor, business-owner, scientist, or other expert (except for one industry lobbyist) showed up to testify against a rule that would protect children from the toxic BPA that is currently used in packaging for infant, baby and toddler food. Almost every time a child in the U.S. eats food from a can or a glass jar with a metal lid they are being exposed to BPA, and dozens of people showed up last week to express their support for government protections from this dangerous toxic chemical. On Thursday, September 6, the Maine Board of Environmental Protection and the Maine Department of Environmental of Protection held a joint hearing on some proposed changes to Maine’s rules about BPA. The changes being considered were submitted to the Board by over 800 Moms and other citizens of Maine. If the Department and the Board agree to adopt the rule changes, our state would be a much safer, healthier, thriving place for young children in Maine – who could have their exposure to BPA reduced by up to 2/3. BPA, or Bisphenol-A, is a toxic, hormone-disrupting chemical that is found in many of the products we use every day. Hundreds of professional, peer-reviewed scientific studies have confirmed that BPA is responsible for increases in many health problems suffered by developing babies, young children, and adults. Early puberty in girls, sexual dysfunction in men, behavioral and attention problems, learning disabilities, obesity, prostate cancer, breast cancer, reproductive damage, diabetes, and more are all associated with this ubiquitous chemical. It was heartening for me, the rest of the NRCM team, our partners in the Alliance for a Clean and Healthy Maine, and parents, doctors, scientists, and many others, to see so much support last week for this common sense change to our chemical regulation rules here in Maine. There shouldn’t be any controversy—the Board already ruled on the harms of BPA in 2010,. The science is clear that children are being exposed to BPA in baby food, and there are safer alternatives to food packaging widely available and affordable for sale in Maine. Unfortunately, few well-funded chemical industry lobbyists are trying to convince us otherwise. Let the Board know you support the proposed ban on BPA in food for children under three. They will continue to receive public comments on the rule through September 28, 2012. BPA is only one of thousands of chemicals used in the manufacturing and end-use of products we use every day. Over the past 50 years, NRCM has fought many other battles to reduce human and environmental exposure to toxic chemicals and materials. And we’ll keep working hard to minimize the use and proliferation of known toxins— with your help. Come to Augusta on Saturday, September 29th to join our Rachel Carson 5K and Kid’s Fun Run in Capitol Park at 9am. The event is named for environmental hero and writer Rachel Carson, for the 50th anniversary of the release of her ground-breaking book Silent Spring. This event is a fun way to celebrate all that we’ve accomplished on toxics reform, and how far we still have to go. For more information see: http://www.nrcm.org/RachelsRun.asp. This blog is amazing, I am going to put this in my bookmarks before I misplace the link I don’t think I’ll ever find my way back again otherwise.